Humans invent evolving viruses to ravage computer networks, and the programs they infect wake up. Sentient programs corrupt a small server relay at LAX, and hundreds of humans die in mid-air collisions. Mankind teeter on the verge of a nuclear war, which would kill millions of humans and sentient programs alike. Welcome to Virtual, where two separate worlds are not-so-separate anymore. 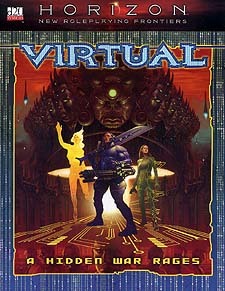 In this d20 mini-RPG, the players take on the roles of newly awakened sentient programs in the vast network of computers crisscrossing the globe. Become an antiviral, programmer, battle AI, or webcrawler. Take up arms against the nigh-unstoppable progenitor viruses or go into business for yourself as a smuggler, bounty hunter, mercenary, or data thief. Or take on the ultimate heroic challenge of preventing mankind from destroying itself, and your virtual world, in an apocalypse of nuclear annihilation.